The script is prepared to perform visual inspection of the automatic algorithms, with the bGUICorrection flag, but it is disabled by default. In the following listing, you can see a typical output of the example script. No multilead strategy used, instead using the delineation of lead MLII. 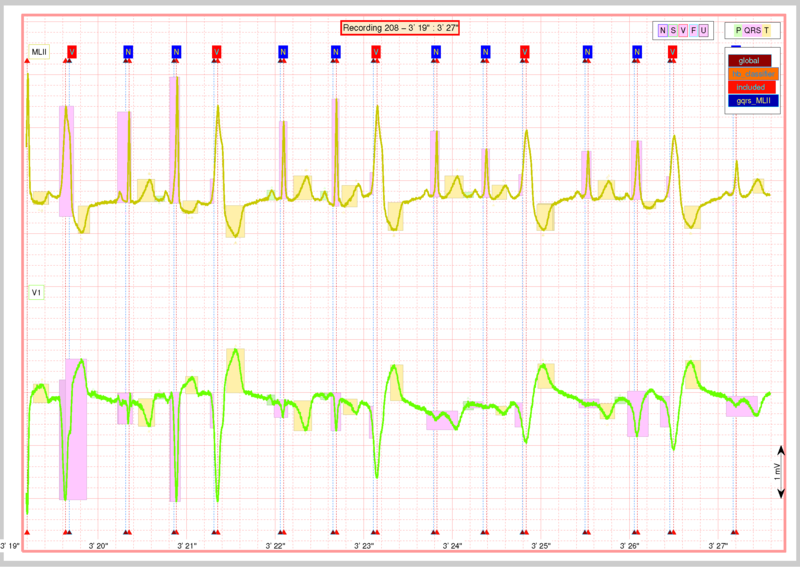 Requirements not satisfied in \your_path\ecg-kit\recordings\208.hea for task PPG_ABP_detector. The result produced is exactly the same as the QRS detection task. This can be convenient for backing up intermediate results and reproducing experiment results. Other interesting aspect to differentiate experiments is the user_string property of the ECGwrapper object. Note that the results produced retain the user string suffix. 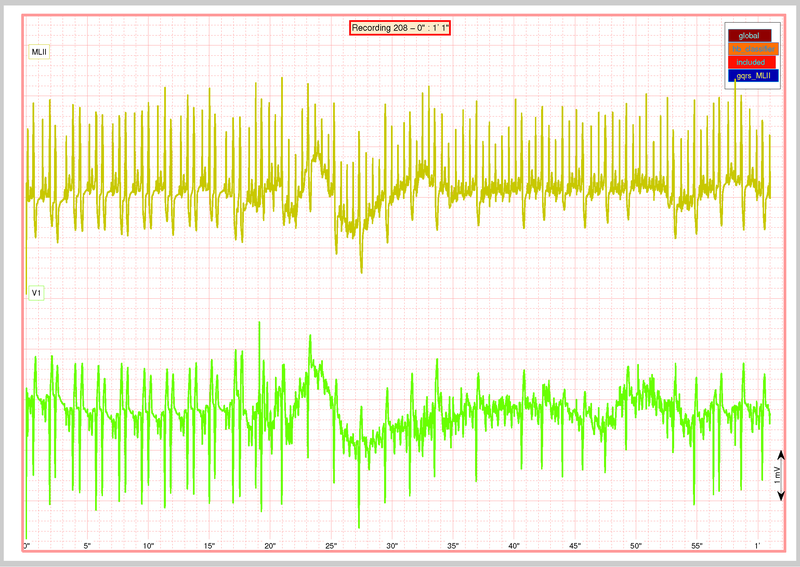 After that, the example performs heartbeat classification and finally produces a report. First in the report you will find an overview of the signal. global, the wavedet multilead detection. hb_classifier, the detection used by the heartbeat classifier. included, the gold-standard, visually-audited Physionet detections. gqrs_MLII, the detections of gqrs algorithm in lead MLII. Above the legend of QRS detections, it is the delineation legend, with a colour-code for identifying each wave. For example in pink you can see several QRS complexes correctly segmented, but three of them are wrong. If you pay attention to the extreme widened ventricular beats, they are very underestimated. T-waves in orange, seems quite correctly measured, and P-waves as you can see are not correctly measured at all. You can experiment with the /examples/second_simple_example.m to see how to extend this experiment to a multiprocessor environment.